It's funny how non-guitar-playing folk get the concept of a new pair of faded, distressed jeans but absolutely balk at the idea of a relic guitar. And sometimes you just get tired of having to continually rationalize the rather beat up appearance of your relic'd axe to annoying relatives -- your lengthy explanation of the precise scientific processes involved in simulating age on a brand new guitar is usually met with glazed looks, and a subtle shaking of the head. Followed by the inevitable, "How much did you pay for it?!" I keep my guitars in a toolshed I built out back. One day I'll get round to putting a roof on it. I left it with my brother for over a year. Whenever he and his wife have a fight she takes it out on the guitar. When I told my kids not to play with daddy's new axe, they tried to chop a tree down with it. I tied the guitar to the back bumper of my car and dragged it around town for a couple of hours. I heard that's how they do it at the Fender Custom Shop sometimes. If you think this is bad, you should see what our cat does to the furniture! I've used this thing in more bar fights than I can remember. People say I play harder than Stevie Ray Vaughan. It was a brand new guitar when I checked it in on United Airlines! This is my dog's guitar. Thanks to Stratoblogster for inspiring this post! I believe the relic models will cost an arm and leg. 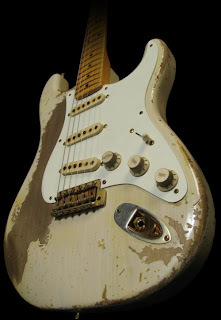 If a strat comes up for sale with natural wear as shown here, I think I'd love to buy it and then give it to a good luthier to make it playable again. That's what I would do too. An old guitar that's been played a lot just vibrates differently. Man, that was just sad..